Is Your World Upside Down? It was a gorgeous day outside and so I sat out on the patio and wrote some, hoping to catch a picture of the birds, but the only one that came close was the female cardinal, usually the most skittish of birds and she sat in a shrub right next to me, but the pictures still didn’t turn out. A big bird, not Big Bird, but some big bird, I figured was a predatory kind, landed in the leafless maple tree. 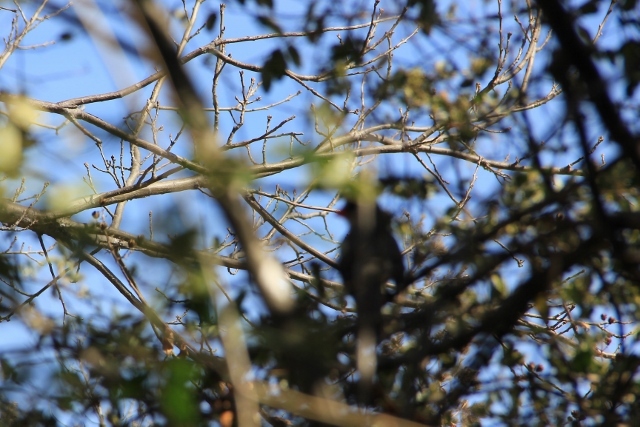 I saw its white breast feathers, that it was big, and then it moved somewhere too high that I couldn’t see it through the trellis, though he continued to yell at me. I was dying to get a shot of it, to see what it was. The cardinal was on the shrub next to me, watching him, and watching me. She was in between us. But I think she was more worried about the big bird. It was probably a hawk. I see them a lot, but I hadn’t see one in the tree before, just on our electric wires sometimes. Usually they’re quiet. Unless they’re flying around. So I’m still curious. The top picture is of my upside down world. While I was waiting for a bird to come around so I could take a picture, which of course they wouldn’t, I looked around to see what else I could get a shot of that looked interesting. 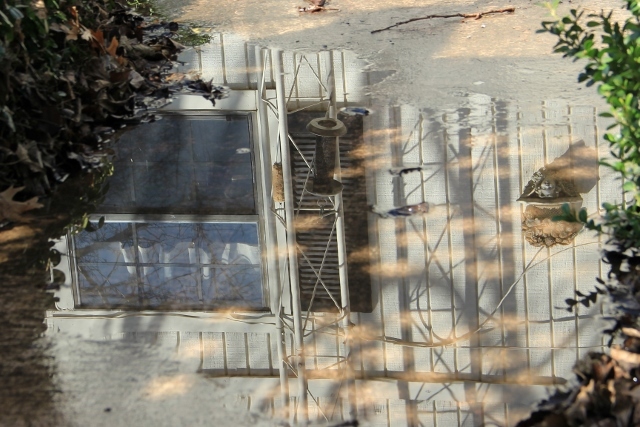 A reflection of the bird feeders and side of the barn in a puddle of water. It’s like looking into another dimension. Too cool for words, right? You make it seem so easy. I have been thinking of writing my own book. Not sure. I love to write and have some ideas already. My world is upside down, and sideways, and slantways, and any other ways you can think of. Lol. LOl, mine is too. Sometimes, the scenes just come and other times, I have to fight to make them happen. 🙂 You just never know. Like I’ve been trying to come up with the final scenes while still writing the middle of the book. But oftentimes while I’m writing those scenes, the end will come to me. Or I’ll be working on edits and realize I have threads of thought woven through the story that I can expound on, and I’m off and running!